Efforts by state lawmakers to find money to repair South and West Texas roads torn up amid a drilling boom appear to be stalling, according to some officials working on the matter. Officials warn about the hazards of not maintaining these roads. As he looks at the calendar, DeWitt County Judge Daryl Fowler is getting nervous. Fowler is among a group of officials in the Eagle Ford Shale area who are lobbying lawmakers for money to address the rural South Texas region’s roads, many of which have been pummeled by drilling activity. With about a month left before the legislative session ends, he and others fear the push for funding has stalled. The Texas Department of Transportation has estimated that maintaining infrastructure impacted by the drilling boom will cost $4 billion a year. Advocates are urging lawmakers to tap the state’s Rainy Day Fund to help repair — and, in some cases, widen — roads in the counties where drilling is most active. This week, the Senate unanimously passed Senate Joint Resolution 1, which would ask voters to approve spending $5.7 billion from the fund, including $2.9 billion for transportation debt. But little, if any, of that money is likely to go toward repairing roads in areas hit hardest by the drilling boom. Bringing a gas well into production requires more than 1,000 loaded trucks traveling to and from a well site, the equivalent of 8 million cars, according to TxDOT. 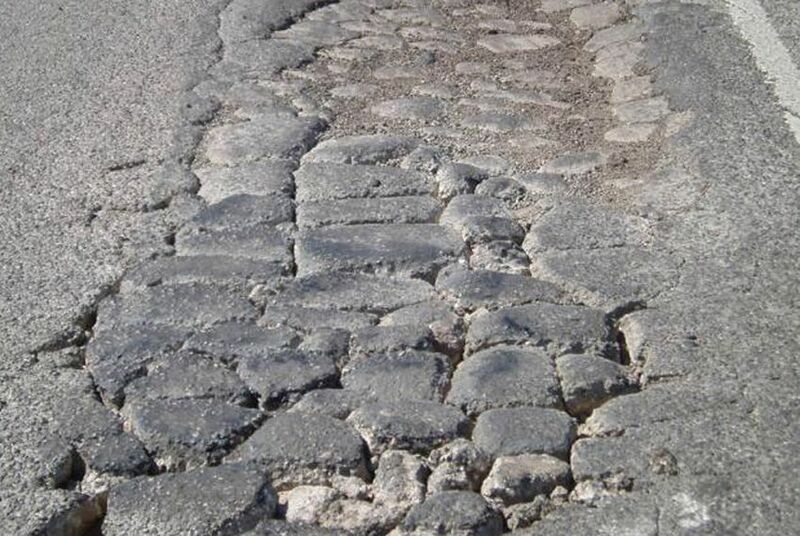 In two drilling hotspots, the Eagle Ford Shale in South Texas and the Permian Basin in West Texas, crumbling asphalt and widening potholes are becoming more common, county officials say. Vehicular accidents are also surging, in part because many of the roads are too narrow to safely handle the convoys of trucks driving over them to reach wells. A recent report by the Texas Department of Public Safety identified a rise in crashes, particularly those involving commercial vehicles, in the areas at the center of the drilling boom. In the three Eagle Ford Shale counties where drilling is most active, the number of crashes involving commercial vehicles rose 470 percent between 2009 and 2011. In the 17 counties that make up the Permian Basin, fatal car crashes involving commercial vehicles have nearly tripled from 14 in 2010 to 41 in 2012. Energy firms have also complained about having limited access to wells as roads have become nearly impassable. "If we allow these roads to continue to deteriorate, we could kill the goose that lays the golden egg,” Sen. Carlos Uresti, D-San Antonio, said in a statement. “The oil boom cannot be sustained if we don't give counties a way to maintain these roads." Uresti passed a bill out of the Senate this week that would allow counties to designate “transportation reinvestment zones” that would be eligible for applying for money from the state for road maintenance and repair. He has previously said he hopes funding for Senate Bill 1747 would come from the Rainy Day Fund. Comptroller Susan Combs has projected the fund will have $11.8 billion by the end of the 2014-15 biennium. Uresti’s bill is emerging as the leading proposal to address the issue, in part because it has the support of the Texas Oil and Gas Association. Deb Hastings, executive vice president of the association, said her group is hoping for an infusion of at least $3oo million to $400 million from the Rainy Day Fund for the measure. She added that the Rainy Day Fund is a logical source for the funding as the money in it comes largely from taxes on oil and gas production. House Energy Resources Chairman Jim Keffer, R-Eastland, expects to hold a hearing soon on Uresti's bill. Keffer also passed a bill similar to Uresti's out of the House this week. Editor's note: An earlier version of this story misidentified a bill referred to by state Rep. Jim Keffer.